The average cost of assisted living in Saint Augustine is $2,937 per month. This is lower than the national median of $3,346. Cheaper nearby regions include Green Cove Springs with an average starting cost of $2,500. To help you with your search, browse the 45 reviews below for assisted living facilities in Saint Augustine. On average, consumers rate assisted living in Saint Augustine 4.1 out of 5 stars. Better rated regions include Palm Coast with an average rating of 4.2 out of 5 stars. Caring.com has helped thousands of families find high-quality senior care. To speak with one of our Family Advisors about assisted living options and costs in Saint Augustine, call (855) 863-8283. Saint Augustine, Florida, known as the oldest city in the nation, is rich with Spanish architecture. Seniors can take historic tours in the downtown area as well as choose from 11 Assisted Living Facilities within city limits. ALFs are considered in the state of Florida to be facilities that provide health care and home services to the elderly in a homelike setting. They provide daily activities such as medication management and personal care to resident seniors. Policies for these facilities are regulated by the Florida Health Care Association. The Saint Augustine area is home to world-class medical facilities, including Flagler Hospital, in the event of medical emergencies or illness. Seniors on a budget living in Saint Augustine may find that they can easily build their savings because the cost of living is only 5.8 percent higher than the national average. Saint Augustine has higher crime rates than the national averages. Violent crimes are rated at 60.8 out of 100 (1 being the safest) which is higher than the U.S. average of 31.1. Property crime is rated at 70.1 which is higher than the U.S. average of 38.1. Seniors and their loved ones may feel unsafe in this area. Seniors are able to be active all year round with the warm climate in this city. With average high temperatures of 89 degrees and warm winters with average lows of 46 degrees, seniors with limited mobility can easily get around. Saint Augustine has many local attractions for seniors. The Castillo de San Marcos is a masonry fort and national monument where seniors can explore rooms that used to house soldiers and take tours. Seniors can also visit the Father O’Reilly House Museum for a taste of how Saint Augustine used to look. Saint Augustine does not have its own transportation service, but the county's Sunshine Bus Line has routes that run right through the city and offers senior discounts. Assisted Living costs in Saint Augustine start around $2,937 per month on average, while the nationwide average cost of assisted living is $4,000 per month, according to the latest figures from Genworth’s Cost of Care Survey. It’s important to note that assisted living rates in Saint Augustine and the surrounding suburbs can vary widely based on factors such as location, the level of care needed, apartment size and the types of amenities offered at each community. 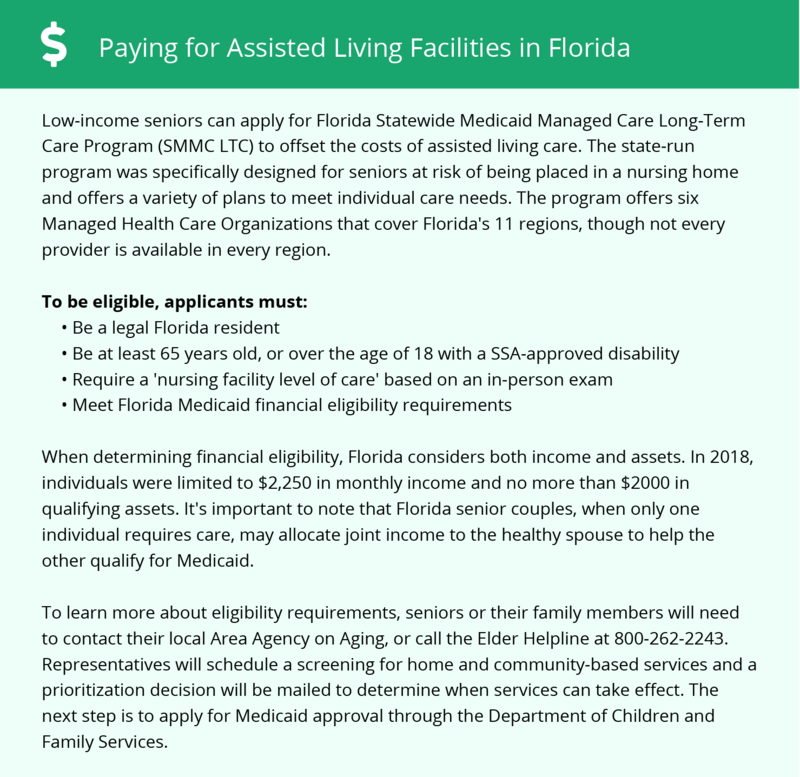 Low-income seniors who are eligible can qualify for financial aid for assisted living costs through the state’s Medicaid Managed Care Long-Term Care Program. Seniors can also receive help from a non-Medicaid program called the Optional State Supplement. Saint Augustine and the surrounding area are home to numerous government agencies and non-profit organizations offering help for seniors searching for or currently residing in an assisted living community. These organizations can also provide assistance in a number of other eldercare services such as geriatric care management, elder law advice, estate planning, finding home care and health and wellness programs. To see a list of free assisted living resources in Saint Augustine, please visit our Assisted Living in Florida page. Saint Augustine-area assisted living communities must adhere to the comprehensive set of state laws and regulations that all assisted living communities in Florida are required to follow. Visit our Assisted Living in Florida page for more information about these laws.